That title is a variation of a quote by the American author, Rick Bass, but it seems very appropriate for our own July this year. Once again, we are wondering where on earth another month has gone. Here we are on 29th July, August is just around the corner, and inland Andalucia enters its snoozy phase. This last weekend saw the start of the holiday period, with many Spanish heading for the coast to escape the temperatures of high summer inland. We have spent our first month in the Hobbit-house - our diminutive studio apartment in the heart of our new village of Moclín. It is a little like living in a caravan. Everything is very compact and fitted in order to squeeze as much into the space as possible. We have just about managed to remember to duck every time we go through a door to avoid concussion, but it might be hard being confined to such a small space for what could be the next 5 months! In order to survive until we move into our new home, we are trying to fill the time between now and the end of the year with exciting projects, so we have been extremely busy. Firstly, we have recently launched our new business venture together! Since we moved to Spain, it has always been our intention to start some sort of joint business, and we always assumed that this would be travel-related. We have also spent the past 22 months exploring as much of our new surroundings as possible, and love taking family and friends to those places we have discovered, and it was this love that became the foundation of Granada Concierge. Through the business, we aim to be the friends of other visitors to the part of Spain we now call home, and sharing our passion. The concept, we hope, is relatively simple: we chat to people who might want to come to Granada for a holiday or trip, and we then put together a detailed mini-guide for those visitors based on their personal likes and dislikes. Have a look at the website, if you haven’t already done so, and let us know what you think. If you like the idea, do please share it as much as possible to get the word out to all our future clients! The house build continues apace, although we expect progress to slow a little during August. Fortunately, the builders are not downing tools completely to go on holiday, so there will still be some progress. We are now down to the last stubborn chunks of rock that threaten to obstruct access to the garden and the provision of a level and flat ground floor. Our builder, Juan, has always been slightly worried about using expanding cement, injected into the rock, to break it down, as he feared that this might remove so much rock that the walls of the original house may well collapse. However, it appears that this is the last resort, and possibly the best way to get rid of the remaining rock, so next week a few test holes will be drilled and expanding cement poured. We have taken a few videos of the progress to date and these have invariably been met with comments such as “this looks like a big project’ which does little for our nerves. It is bad enough looking at the deep hole where half of the property we bought used to stand, and gazing out at a pile of building rubble that covers what used to be our garden. Once the foundations are in, the build proper will begin, and we know that this will be a rapid stage. Our architects are relentlessly encouraging and supportive, although I do get worried when Ana (one half of the architectural super couple) keeps remarking that I look angry and worried all the time even though I have tried to reassure her that this is my resting face! Thank you to my Dad for giving me a visage that is fixed into a perpetual scowl. On top of all that, and in order to keep us amused, Andrew and I are getting married! I am being slightly flippant, but this is something we have resisted sharing widely until now, as we were keen to ensure that our family, first and foremost, were all able to come to share the occasion with us, and this is scheduled for Saturday 8th September at the Cortijo of friends, deep in the Granada countryside. Andrew and I are loving our adventures together, and I was delighted when he asked me to marry him, early on Christmas morning some seven months ago. There are stories a-plenty surrounding the marriage process here in southern Spain, and we will be sharing these tales through the blog over the next few weeks. Suffice to say, we are thrilled and excited about this very special moment and cannot wait to share many more adventures to come. Finally, we have bought a kayak! Despite our near-death experiences of kayaking off the coast of Mallorca, we still love getting into a boat and paddling off somewhere. The children bought me a Decathlon gift card for my birthday last year with the intention of this going towards to purchase of an inflatable kayak for fun on the water. Now that we live near two beautiful and tranquil reservoirs, where kayaking and sailing is allowed, it seems the perfect time to invest. These lakes will also double as our swimming pool in the absence of a tub in our own back garden. Yesterday, we took our maiden voyage and it was perfect. Fortunately, the kayak is incredibly easy to inflate and we soon found ourselves getting into a rhythm as we crossed this stunning turquoise body of water, investigating little coves and inlets. 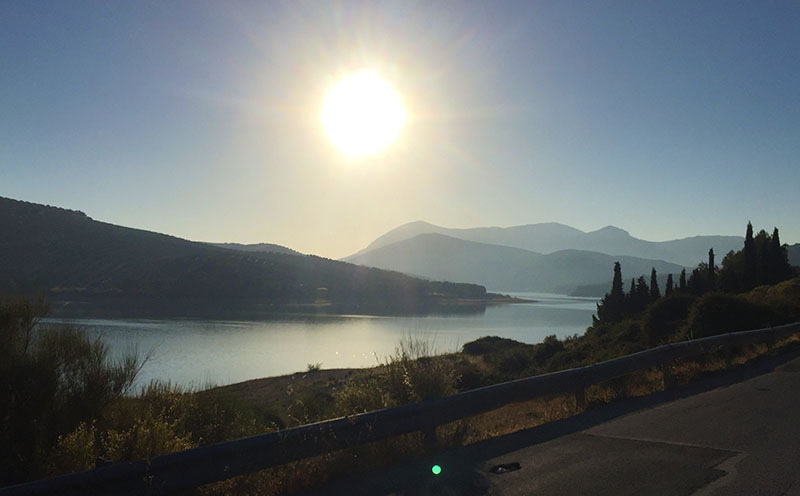 We were completely alone on the Embalse de Colomera, surrounded by stunning scenery, the warm water gently rocking the boat as we tucked into a little picnic. We swam, lay back in our kayak and marvelled at the silence; it felt like our own private little world untroubled by anything snd it was every bit as gorgeous as we had imagined. So, in the course of just a month, a great deal has happened. We have been visited by friends who have been keen to see our new village and future home; we have made new friends here, and found beautiful new places to explore. We have enjoyed meals and drinks in new bars, and revisited many of our favourite bars. We have found antique doors for our home, a place where we can buy unlimited quantities of fine olive oil from our neighbouring countryside. 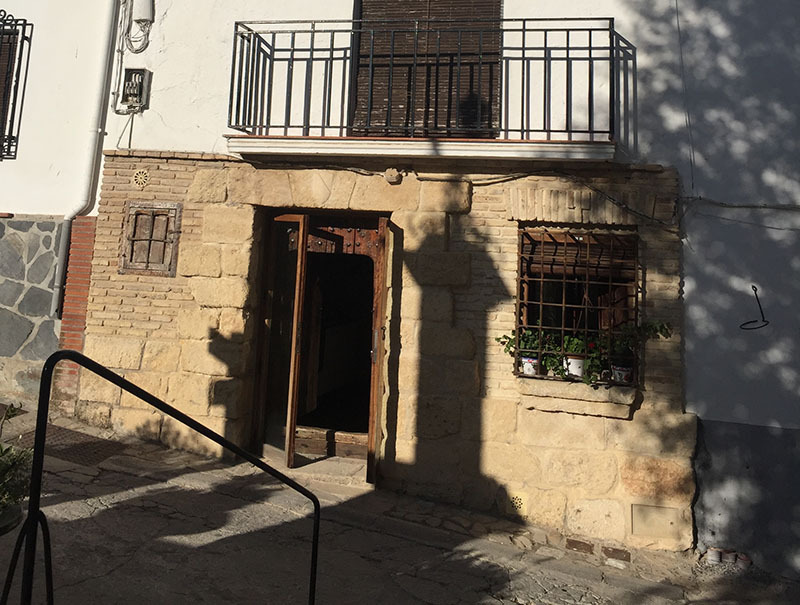 We have been introduced to residents in the village who run cultural events and manage accommodation, artists and printmakers, and already Moclín feels very much like home. We love it here.